Learning by . . . This piece will rearrange or enhance the synapses I believe. After I finished the artwork and was enjoying the view (sometimes I can actually do this without mentally attempting to “improve” the painting). I began to have a new and curious feeling I hadn’t quite felt before with one of my abstract paintings,at least not so directly. As I gazed at the painting somehow I felt a mental change, like I was smarter (in some way). Perhaps it was similar to the way a baby looks at a black and white mobile to get its brain booted up. I thought the act of viewing this painting was rebooting some part of my mental processes – like new software. I could have titled it Bob_2.0. I suspect many people will think this is completely ridiculous but I intend to continue working on the complex black and white paintings – with a few color elements – to this end. They are a big favorite of mine anyway, and this interesting feeling I had is an extra impetus to work on them. I’m not sure if the retina cones are processed in the same way by the visual cortex and brain as are the b&w rods, but it seems to me they could not be quite the same, and probably are very different. I don’t seem to get that booted-up feeling from colorful art so much as from some b&w art. This also seems like a good direction to pursue. I used to have a poster of a Salvador Dali painting, “Hallucinogenic Torreador.” It is probably my favorite Salvador Dali work that I’ve seen. Now that painting might operate on my brain like my abstract painting, “Learning by . . .” But I don’t recall feeling like my brain was getting booted-up when I viewed HT. It’s been decades since I owned that Dali poster. The Wiki link has a lot more information on “Hallucinogenic Torreador” than I ever had before, which was minimal. Houston my Once upon . . .
I’ve already blogged a little bit about Houston. I won’t say too much about the place. It’s been in the news after the recent world-class 50″ rainfall. It never rained that much when I lived there back in the middle 80s but I did see some huge rains of course. Anyway, I don’t want to blog about any rainy wet stuff. This is a fantastic photo of Houston. It can really be quite the looker sometimes. And it felt like my creative art mother (also sometimes). Not always but the feelings are still there even after all these decades. Another “legacy wall sculpture” I made back in the day 🙂 I had a downtown art studio on San Jacinto Ave in Houston, TX when I was creating these pieces. But it’s been so long I don’t think I get any ego trip from it anymore. Most of the artwork was done in the apartment living room using my little Dremel tool saw. My ex-wife put up with a lot from me (always) and I wonder how many wives would be okay with hubby sawing out wooden pieces in the tiny apartment living room! But during this time she could see my artistic self was very motivated and I was getting some art production moving and in a definite, solid direction. I may be fibbin’ a bit (little white lie) so far in this post – but I’m guessing nobody cares except me, and… not even me anymore. This piece Wooden Galaxy was probably created in the house we moved to over in the north loop Heights section of Houston. That house was a productive art studio home for me. Considering my diet was baked potatoes, marijuana, and diet coke, I managed to get a lot of art done – at least I thought I was! HAHA And I was. These numerous small wall sculptures got me into Kauffman gallery at the end of 1984. They loved my art and sold quite a few of them (and much larger wall sculptures) through the years. But I realized a long time ago that wherever I live I can produce art that doesn’t make me cringe (too much haha) decades later. I find inspiration in the external world wherever I live, but my artistic self makes it happen ultimately. That being said, some locations are great for the artist to grow and thrive and others not as much. Houston really was the artist nurturing home for me from 1981-1985 especially. So I got top billing among the usual artsy objects in the show. That was very upsetting considering how hard I’d worked. The nurturing felt like it was over!! My wife and the gallery people told me not to worry about it, but i felt like something was lost, or over, or…. I don’t know. I didn’t want to live in Houston anymore. haha Maybe a bit of an over-reaction. Think of a song, to the title of “Secret Agent Man” of about a million years ago. But it’s called Installation Man! 🙂 haha. Well, it felt like that when I was trying to make this installation work at Underwood Center back in 2006!! I was granted a work reprieve of ONE WEEK!! to make it happen in the back end gallery space. Not a boatload of time. I could have worked on it more – Dawn Wolf-Taylor the director was ever so kind to give me rides to and from the gallery. I had already quit driving by that time. Seizures (that should explain it). And she probably would have given me even more rides up to the gallery to work more. I painted 80′ (as I recall – at least) of wall space and installed a mobile in the center. It was imho a good success. If I’d planned better it would have been even more cool than it was. But my painting process has always been about painting and then repainting, often several times. This project was not going to easily lend itself to that. More planning would have been probably building a model and working through a lot more work in the model stage. I’d never done too much of that. But the photos I took and all the mileage I’ve gotten since, using those photos to create new artwork, have been the best part of the experience for me. I’m using a highly modified one now as the header photo for my new website: Abstract Painting by Robert Terrell. As time goes by I might search for more photos of the world famous (in the mind of me) art installation at Underwood Center 2006. I lost any fear of painting large, that’s for sure! I’ve painted for over 30 years almost exclusively on wood. It made sense because I was making wall sculptures. Then I got a commission in 1996 and there was an ADA stipulation that it couldn’t protrude from the wall more than 4″. I was the safety coordinator at TTUSOA and really didn’t know about that! Well… another story that I probably won’t blog about. Ancient history. I’d been creating wall sculptures with no regard for the z-sxis (the protrusion into the third dimension) except for design reasons. And as long as I could make each design hold together, it was good. But now it seemed, I was in a new design world. The 4″ restriction very much changed my whole approach (but I noticed that for Frank Stella it didn’t seem to create a ripple at all! Oh well. He made art for museums and I was happy to get art commissions here and there. That’s what caused the big change for me in the first place. I got a commission for two wall pieces that had to comply with ADA. So, the designs really had to shrink a LOT along the z-axis. 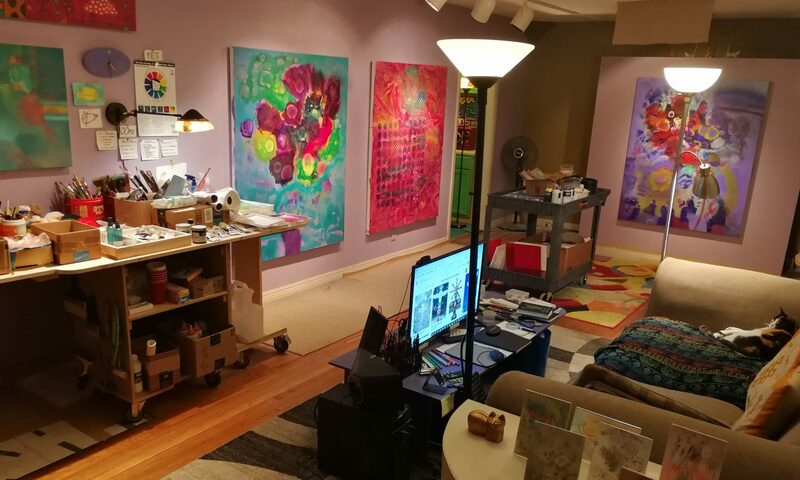 Where I had produced some wall sculptures that protruded out from the wall a foot or more, now that 4″ restriction changed my wall sculptures into bas-relief paintings, or 2-1/2D paintings! Those first two commissions were really two wall sculptures that looked like they got run over by a truck. haha I was still creating in the “exploding” style I had been, with pieces blowing out from the center. Only now, with these two pieces, they weren’t blowing any more, except sideways!! haha I wasn’t laughing too much then, and I really delayed on those two commissions. I never got any more commissions from that company down in Houston. Can’t blame anyone but my own little self. Still, things really changed for me after that. It wasn’t the end of the wall sculptures, but the war was lost (in my mind). Perhaps the mind can trick an artist, or anyone. Ya think?? And this piece has the Z-none axis (none at all), other than the illusionistic spaces created by yours truly. And black & white! I had a dream of an ALL black and white art show over 30 years ago. Still thinking about it. This piece has so much going on. I kept working on it for quite a while and things would happen in my little world, which would show up. And now… do I mention them or what? For this evening I’m done. I think this is a blather-post. May need to edit out a lotta lotta. THEN I might add-in some Hurdy Gurdy Dream Reef yadda yadda . . . Thought it be time to insert another Abstract Painting by Robert Terrell acrylic painting on canvas 🙂 How’s that for a totally transparent plug for my artist website?? So… not sure where to go from here. I just had to paint an object-like thing or two in this painting. I’ve hardly done that in many decades. So if you look (and not even too closely) there’s the trout with spots falling off, and several other recognizable and not quite recognizable somethings I painted into MESO “88.” I kind of let my artist’s OCD talent go too far perhaps ~ NOT! Oh I’m loving this one. Anyway, I’ve really enjoyed painting all the B&W artworks quite a lot, and I’ve painted a few of them in the last three years. My first gallery “owner” Larry Kauffman told me don’t bother, he couldn’t sell B&W. He could really sell colorful art though. He started representing Hundertwasser, and I remember seeing his big wall covered in Hundertwasser prints, about, ohhh well smallish size less than 18″ and landscape format. I’ll post more photos of the wall sculptures and the 2-1/2D revolution of the late 20th century soon.